T-42 'Pink Perfection Strain' Recorded as being "selections from seedlings of L. leucanthum var. centifolium x L. sargentiae". 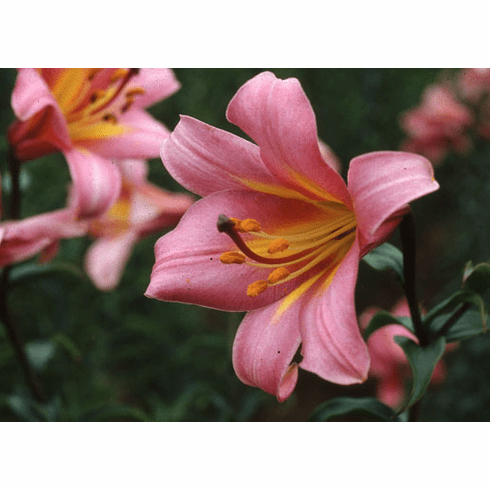 We believe that the original stock of this lily was bred by the late LeVern Friemann and sold to Jan DeGraaff in the late 1940's as was reported to us by Mr. Friemann. The records show this lily was selected c. 1950 and was released in 1960. A very popular strain, color can range from light pink to purple-black. Photo inset #1 courtesy of Edward McRae. Photo inset #2 'Pink Perfection' seedling selection, B & D Lilies.